The origins of the Yerkes National Primate Research Center of Emory University can be traced to an article written by the Center’s founder, Robert M. Yerkes, PhD, and published in Science in 1916. In the article, Dr. Yerkes called for the establishment of a primate research institute for the systematic study of the fundamental instincts and social relations of primates. Dr. Yerkes reasoned that primates, because of their evolutionary closeness to humans, could shed the most light upon the roots of human behavior. 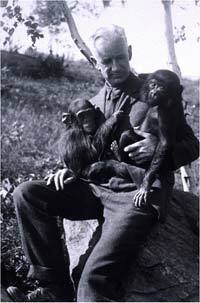 Dr. Yerkes’ research on his first two great apes and the other animals he was able to study during the 1920s persuaded Yale University, the Rockefeller Foundation and the Carnegie Foundation to fund the establishment of the Yale Laboratories for Primate Biology. The Center opened in 1930 in Orange Park, Florida. Dr. Yerkes, who received a doctorate in psychology in 1902 from Harvard University, was a distinguished professor of psychobiology at Yale University when he established the Center in 1930. The chimpanzee colony included four animals that Dr. Yerkes had in Connecticut, 13 chimpanzees that were donated by a prominent Cuban citizen and 16 apes that were a gift from the Pasteur Institute of France. The same year, the first chimpanzee birth occurred at the Center; the offspring, named Alpha, provided Dr. Yerkes with the first detailed observations of a chimpanzee’s development and reproductive processes. In 1941, when Dr. Yerkes retired, Yale University renamed the Center the Yerkes Laboratory of Primate Biology in honor of Dr. Yerkes’ leadership and contributions to science. With Dr. Yerkes’ death in 1956, Yale officials decided the geographical separation of the university and the Orange Park facility was not conducive to the development and conduct of collaborative research and educational programs for Yale faculty and students. Emory University agreed, in 1956, to assume ownership of the Center. The transfer occurred at a time of increasing scientific interest in the study of primates, in part as a result of the development of the polio vaccine through primate research. In 1960, the U.S. Congress enacted the National Institutes of Health’s (NIH) Primate Research Centers Program to provide the scientific community with the specialized resources needed for primate research. The following year, Emory received NIH’s Regional Primate Research Center status for the Yerkes facility in Orange Park. NIH funding enabled the transfer of the Center to the Emory University campus, which was completed in 1965. A 117-acre field station, located in Lawrenceville, Georgia, opened the following year. 1985 – The Yerkes Research Center received full accreditation from The Council on Accreditation of the Assessment and Accreditation of Laboratory Animal Care International (AAALAC), the gold standard of laboratory animal care. Yerkes has maintained full AAALAC accreditation for 26 consecutive years. 1999 – The Yerkes facility was expanded to accommodate the newly established Emory Vaccine Center, to facilitate vaccine development and research in AIDS, malaria, hepatitis C and other infectious diseases. This same year, the Yerkes Research Center became the first home for the newly formed Center for Behavioral Neuroscience (CBN), which provided resources to foster innovative research on the basic neurobiology of complex social behaviors associated with fear, aggression, affiliation and reproduction. 2001 – The DNA vaccine microbiologist Harriet Robinson, PhD, developed was shown to prevent development of AIDS in monkeys infected with a highly virulent form of HIV. Today, this vaccine is in clinical trials in humans. This same year, memory expert Stuart Zola, PhD, came to Emory from UC San Diego to become director of the Yerkes Research Center. 2002 – The NIH designated the Yerkes Research Center and seven other primate research centers as national primate research centers in recognition of their involvement with and impact on research programs worldwide. 2003 – The Yerkes Research Center became a critical component of the Southeastern Regional Center of Excellence for Emerging Infections and Biodefense, a federally funded initiative to develop new vaccines, drugs and diagnostic tests against emerging infections and to defend against organisms that might be used in bioterrorist attacks. 2004 – The Yerkes Research Center opened a new 92,000-square-foot neuroscience research building with state-of-the-art lab and imaging facilities currently used by scientists throughout the university. The Yerkes Research Center is the only center to have onsite MRI, PET and cyclotron facilities. The center has invested more than $3 million in imaging capabilities to facilitate neuroscience research projects involving studies of anatomy, physiology and function. 2005 – The Yerkes Research Center celebrated its 75th anniversary of advancing science and improving health. 2007 – The National Institute of Aging granted Yerkes researchers more than $10 million during a five-year period to compare changes that occur in normal aging humans, humans with Alzheimer’s disease and humans with mild cognitive impairment to changes that occur in nonhuman primates. The goal is to identify ways to diagnose aging-related diseases earlier in order to increase the chances for effective treatment as well as to develop new treatments based on specific physiological changes. This is the largest grant Yerkes has ever received. 2008 – In the first study of its kind, Yerkes researchers developed the first transgenic nonhuman primate model of Huntington’s disease (HD). This development is leading to greater understanding of the underlying biology of HD and to the development of potential therapies. This same year, Yerkes opened a multi-purpose building at its field station in Lawrenceville. Certified LEED Gold, the CVMAR as it’s known is the cornerstone for programs using social colonies of genetically typed nonhuman primates to help researchers understand the interaction between genetics and environment and the roles they play in human health and disease. 2009 – Three Yerkes researchers received highest honors for their work to advance science and improve health. Yerkes director Dr. Stuart Zola and researcher Larry Young, PhD, were selected as fellows of the American Association for the Advancement of Science, an honor the organization’s members bestow upon their peers. Dr. Young also received one of only four McKnight Technological Innovations in Neuroscience awards this year. Kerry Ressler, MD, PhD, was also recognized for his contributions with the prestigious Freedman Award, which the National Alliance for Research on Schizophrenia and Depression presents annually. 2010 – The National Institutes of Health awarded Emory University $6.6 million to support a Morris K. Udall Center of Excellence in Parkinson’s Disease Research to facilitate collaboration among researchers who will focus on developing more effective Parkinson’s disease treatments with fewer side effects. Yerkes Researcher Thomas Wichmann, MD, is the principal investigator of the new center. 2011 – The Yerkes Research Center began construction on its Dual-Function Facility, which will further research in the national health priority areas of infectious diseases and transplantation. The National Institutes of Health awarded the Yerkes Research Center $15 million for this construction as part of the American Reinvestment and Recovery Act. 2012 – The Institute of Medicine (IOM) elected Yerkes researcher Kerry Ressler, MD, PhD, to its new class. Election to the IOM is one of the highest honors in the fields of health and medicine, and recognizes individuals who have demonstrated outstanding professional achievement and commitment to service. Also, a team of researchers at the Yerkes Research Center and the Emory Vaccine Center received a three-year grant of $6 million from the Bill & Melinda Gates Foundation as part of a worldwide effort aimed at developing an effective vaccine for HIV/AIDS. 2013 – The Yerkes Research Center dedicated its Dual-Function Facility (DFF) and its Integrated Research Addition to its Neuroscience Research Facility. The DFF, which was awarded gold LEED, will support research for more than 60 basic, translational and clinical scientists and staff who focus on transplantation medicine and infectious diseases. The three-story addition, which was awarded silver LEED, includes research space for behavioral neuroscience, drug development, genetics, proteomics and psychiatric diseases. 2014 – The Yerkes Research Center received continued full accreditation from the Association for the Assessment and Accreditation of Llaboratory Animal Care International (AAALAC). Such accreditation shows an institution is serious about setting, achieving and maintaining high standards for animal care and use, and is committed to animal welfare in science. This latest review begins the 31st consecutive year of full accreditation for the Yerkes Research Center. Also this year, R. Paul Johnson, MD, began as Yerkes Director. For more than eight decades, the Yerkes Research Center has been dedicated to improving human health and well-being and to advancing scientific understanding of primate biology, behavior, veterinary care and conservation. We will continue to build upon our solid foundation of scientific advancements and to provide expert care for all of the animals at our research center.